2019 — (accepted) van Dooren, Annemarie, Maxime Tulling, Ailis Cournane & Valentine Hacquard, ‘Discovering modal polysemy: aspect might help’, Proceedings of the Boston University Conference on Language Development. [pdf]. 2017 — Barbiers, Sjef & Annemarie van Dooren, ‘The Syntax of Modal Verbs,’ The Wiley Blackwell’s Companion to Syntax, Second Edition. 2019 — van Dooren, Annemarie, ‘Figuring out epistemic uses of English and Dutch modals: The role of aspect’, the 8th Mid-Atlantic Colloquium of Studies in Meaning (MACSIM), New York University, New York NY. 2018 — van Dooren, Annemarie, Maxime Tulling, Ailis Cournane & Valentine Hacquard, ‘Lexical aspect as a cross-linguistic cue to modal meaning: evidence from Dutch’, Boston University Conference on Language Development (BUCLD), Boston MA. 2017 — van Dooren, Annemarie, Anouk Dieuleveut, Ailis Cournane & Valentine Hacquard, ‘Learning what must and can must and can mean’, the Amsterdam Colloquium, Amsterdam. 2017 — van Dooren, Annemarie, Nick Huang & Gesoel Mendes, ‘The future of want‘, the 7th Mid-Atlantic Colloquium of Studies in Meaning (MACSIM), Georgetown University, Washington DC. 2016 — van Dooren, Annemarie ‘Dutch must more structure’, the North-East Linguistic Society (NELS), UMass Amherst, Amherst MA. 2015 — van Dooren, Annemarie ‘We must to Newark’, the 5th Mid-Atlantic Colloquium of Studies in Meaning (MACSIM), University of Delaware, Newark DE. 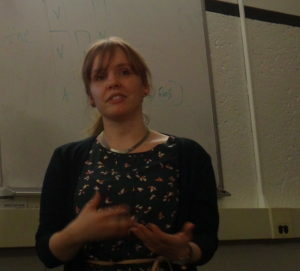 2015 — van Dooren, Annemarie ‘Modal verbs’, the 13th Conference of the Student Organization of Linguistics in Europe (ConSOLE), University Paris-Diderot-7, Paris. 2014 — van Dooren, Annemarie ‘Modality and the diagnostic of non-verbal complementation’, the 4th Central European Conference in Linguistics for Postgraduate Students (CECIL), Lublin. 2014 — van Dooren, Annemarie ‘Modal verbs and their complements’, the Syntax Lab, Cambridge University. 2013 — van Dooren, Annemarie, Lotte Hendriks & Ora Matushansky, ‘Resultatives and path complements’, Secondary Predicates in Formal Frameworks, Utrecht University.[pdf]. 2012 — van Dooren, Annemarie, Lotte Hendriks & Ora Matushansky, ‘Resultatives’, Rencontres d’Automne de Linguistique Formelle (RalfE), University Paris-8, Paris.